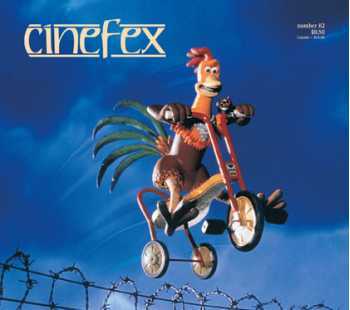 Aardman Animations, of Wallace and Gromit renown, graduated to feature status with Chicken Run, a send-up of The Great Escape, in which a farm's resident chickens hatch a desperate plan to escape being turned into pot pies. Though the comedy employed Aardman's signature stop-motion puppeteering, it also benefited from a range of digital contributions by Computer Film Company. The feature animation division of Walt Disney Studios created an all-new digital facility to support its first computer generated film, Dinosaur, about an orphaned iguanodon whose gentle ways come in conflict with his species' baser instincts. Contributing to the movie's novel look were deftly orchestrated visual effects that blended CG characters with digitally processed live-action backgrounds. A real-life tragedy recounted in the book The Perfect Storm provided the basis for director Wolfgang Petersen's movie of the same name, about a swordfishing boat lost at sea during a storm of unprecedented ferocity. Raising the bar on CG water effects, Industrial Light & Magic produced the digitally engineered tempest, designed to work in concert with large-scale stage effects by John Frazier.